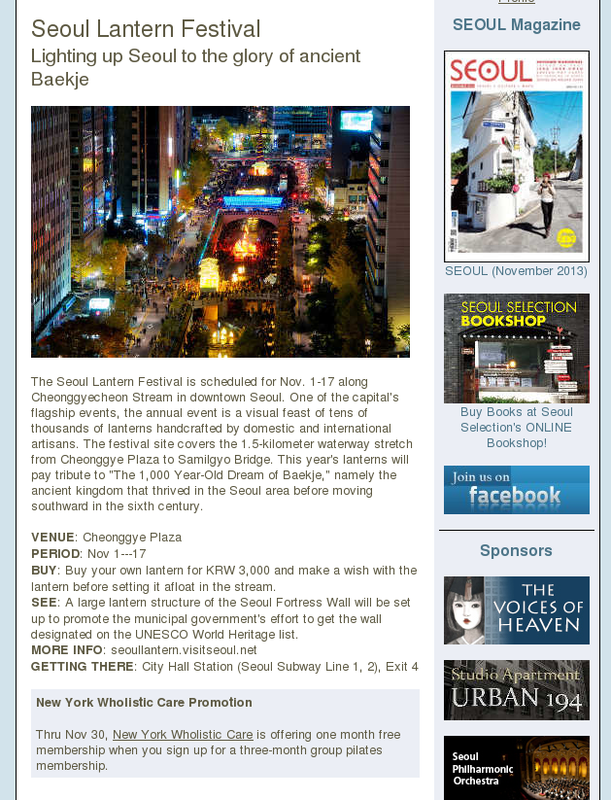 The Seoul Lantern Festival is scheduled for Nov. 1-17 along Cheonggyecheon Stream in downtown Seoul. One of the capital’s flagship events, the annual event is a visual feast of tens of thousands of lanterns handcrafted by domestic and international artisans. The festival site covers the 1.5-kilometer waterway stretch from Cheonggye Plaza to Samilgyo Bridge. This year’s lanterns will pay tribute to “The 1,000 Year-Old Dream of Baekje,” namely the ancient kingdom that thrived in the Seoul area before moving southward in the sixth century. BUY: Buy your own lantern for KRW 3,000 and make a wish with the lantern before setting it afloat in the stream. SEE: A large lantern structure of the Seoul Fortress Wall will be set up to promote the municipal government’s effort to get the wall designated on the UNESCO World Heritage list. – Vdio’s free Korean dramas are creating new fans in North America. – A Korean-born singer has won X Factor Australia. – Korea will get the spotlight at the London Book Fair. – Looking for mountains to see flame grass? See here. – Japanese tourism to Korea has plummeted. – The QiRanger explores Gwangjang Market. – What to do around Seonyudo Station. – Yangsuri, seen from Mt. Yebinsan. And you have to love the birch trees. 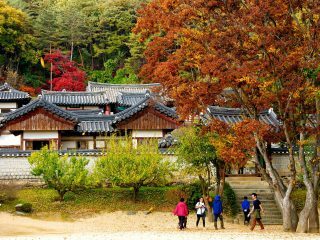 – Songnisan is a beautiful place to visit in autumn. – Yours Truly visited the Suritijae Pass in Boeun. Korea International School is accepting applications for the 2014–2015 academic year. KIS Pangyo Campus serves students in PK–12, and KIS Seoul Campus PK–G6. For more information, and to R.S.V.P. Do you know somebody studying for the Korean university entrance exam? Gormet rice cake maker Suyedang has prepared gift sets of beautiful and delicious “university exam rice cakes.” Koreans believe that sticky rice cakes help students hang on to knowledge and get “stuck” to the university they wish to enter. Suyedang specializes in “flower rice cakes” (hwagwaja). Crafted in the shape of fruits and flowers, flower rice cakes were originally served in the palace at a time when it was difficult to store fruit. Not only are they delicious, but they’re healthy, too, made from 100% organic ingredients. You can find several kinds of university exam rice cake gift sets, from KRW 4,900 (three pieces) to KRW 19,000 (ten pieces). See Suyedang’s homepage (Korean) for more info. Under the skillful baton of maestro Yuri Simonov, the Moscow Philharmonic Orchestra is set to present the best rendition of Russian classical music written by several of the country’s greatest composers. The program will feature Glinka’s “Waltz-Fantasy for Orchestra,” Rachmaninoff’s “Piano Concerto No. 3” and Tchaikovsky’s “Symphony No. 6.” Globetrotting Russian pianist Andrei Gavrilov and cellist Sergey Antonov will join as collaborators. The orchestra was founded in 1951, and Simonov has been principal conductor since 1998. Astor Piazzolla was an Argentine musician who revolutionized the tango, infusing that passionate and somewhat melancholic dance with elements of classical music and jazz. But Piazzolla would later name Bach as a major influence and immerse himself in the German composer’s intellectual works. The concert will feature six of the two composers’ signature works, including “Air on G String” and “Oblivion,” through the talents of violinist Jung Sang-hee, Argentine bandoneon artist Fernando Rezk and Quartet Su. An experimental stage production focused on art, “Savoy Sauna” is the name of the public bath that its director Yeo Shin-dong frequented in his childhood. The drama starts with the question, “How can stage art independently lead a performance?” Yeo thus shares with the actors the image of Savoy Sauna, a motif of individual sensitivity, in searching for the image of each individual. Through this, the process of connecting with others is explored. This work won the Artists Incubator Program supported by Doosan Art Center. Dante Alighieri’s masterpiece “La Divina Commedia (The Divine Comedy)” will be staged as an epic drama spiced with a crossover ensemble of ten traditional musical instruments from Korea and the West. The literary classic describes Dante’s travels through Hell, Purgatory, and Heaven, but at a deeper level, it allegorically represents the soul’s journey toward God. The poem’s imaginative and allegorical vision of the afterlife will skillfully be portrayed through magnificent stage design and impressive choral numbers. The epic will run 150 minutes, including a 20-minute intermission. The RAS will once again offer you its very popular excursion to the magnificent Seorak Mountains in Gangwon Province. In addition to the usual magnificent beauty of this scenic area, participants will have two options of dipping in to the local Cheoksan hot springs, first night, and to even extend the chill-out to second day, at the Seorak Waterpia This is a Hot-spring resort which features a Spa, hot sauna, 18 kinds or artificial waves, etc. For those who would not take the options and rather enjoy the mountain range, you are guaranteed will enjoy the excursion just as much. 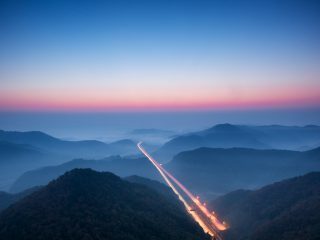 A lone highway cuts its way though a misty Surijitae Pass, Boeun, Chungcheongbuk-do. Photo by Robert Koehler.